Joel Hughes | The Perks of Having Cancer! I would like to introduce to you Joel and Rebekah Hughes, who live in Irvine, California. Rebekah is originally from Southern Oregon and Joel is a Southern California lifer. They often jab each other as to which place is better to live. But for better or worse, So-Cal is home. At the age of 23, Rebekah was diagnosed with stage 1 breast cancer. Her oncologist said that she was the youngest patient their office had ever seen with breast cancer. She made the difficult decision to have a double mastectomy. She did seven months of chemotherapy and then three years of the hormone therapy maintenance drug, Herceptin. When Rebekah had been cancer free for three years, she met Joel and the two were married one year later. 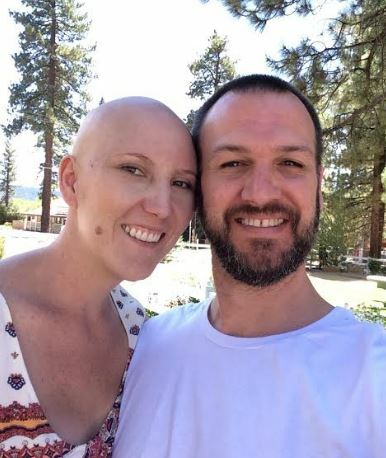 Just eight months after they wed, Rebekah was diagnosed with stage 4 breast cancer. Stage 4 cancer is considered incurable. After many tests and scans, they learned that not only had Rebekah’s cancer returned, but it had metastasized (spread) to her liver, lungs, kidneys, bones, and brain. They found at least 9 tumors in her brain. One radiation oncologist that reviewed her scans said that even with treatment, she probably had 4-6 months to live. She was 26 years old. Rebekah’s diagnosis and cancer remain a constant battle but a huge part of fighting her cancer is that they try to not let it dominate their lives. In fact, they try to live as though she does not have cancer. They are both Christians, and their faith is a central focus of their lives. They like to read, bargain hunt at garage sales and thrift stores, refurbish (upcycle) old furniture, decorate their house, hang out with friends and family, spend time with (Joel’s) kids, and watch Netflix in bed while eating ice cream (double fudge mouse tracks). They also enjoy helping people who are hurting and struggling since they know that pain so well. When someone you love gets diagnosed with cancer, what do you say? What do you do? What do you NOT do? These questions and many others are answered in a new book: HELP! Someone I Love Has Cancer: How You Can Really Make a Difference. 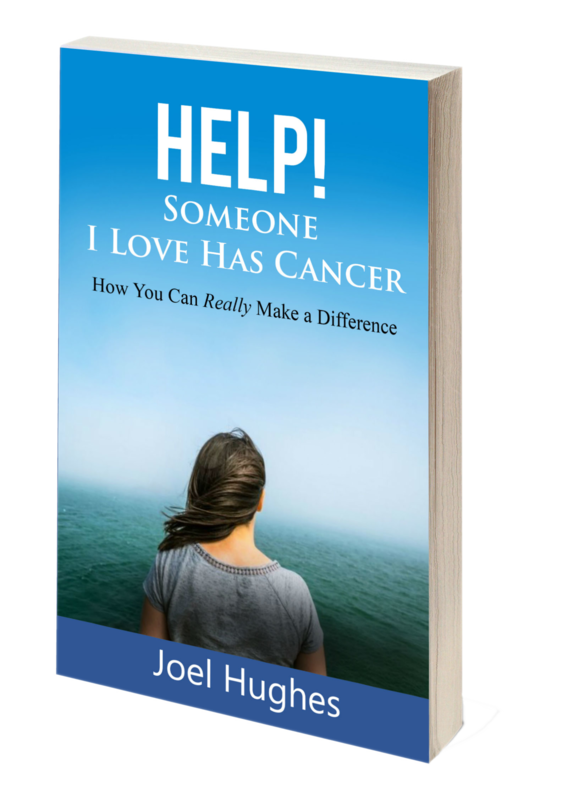 The answers come from a young couple who are in the trenches and valleys of fighting cancer and learning to love through it. In 2014, Joel and Rebekah were married. Seven months later, Joel’s dad was diagnosed with stage four stomach cancer. Two months later, at the age of 26, Rebekah was diagnosed with stage four breast cancer. One chapter of life closed and a new chapter opened. Their cancer journey began. They are now three years into the journey. Along the way, many people have come alongside to help: family, friends, strangers, and some out of the woodworks. Many are helpful. Joel calls them “Cancer Angels”. Others try to help but end up doing just the opposite. Joel calls these folk “Well-Intentioned Dragons”. The book is clothed with many stories of encounters with these “dragons”. This book will help you become a Cancer Angel and, hopefully, not be one of the dragons. Joel Hughes is a husband and father. He is also the author of In Your Corner (coming soon), co-producer of the movie A Brave Hope (coming soon), and director of Rebekah’s Hope. He holds degrees in Christian ministry and philosophy. Joel lives in Southern California with Rebekah and his two kids.